Comper Smarkin is the Smart Beauty Tool for Everything! We do a lot of gadget reviews on our site. We've come to the conclusion that there's a gadget for just about anything! Technology is even available for home skin therapy. With the tool we are about to review, you can firm skin, reduce wrinkles, heal acne, and more! We are reviewing the Comper Smarkin. 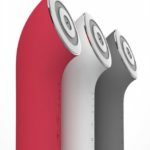 This tool is an IndieGogo project that was debuted at CES 2019. It's … [Read more...] about Comper Smarkin is the Smart Beauty Tool for Everything!